In a new development in the Fast and Furious gunwalking case, the Justice Department's Inspector General (IG) is making inquiries into the possible existence of a missing third weapon in the 2010 murder of Border Patrol agent Brian Terry, CBS News has learned. According to sources close to the investigation, the IG is questioning the Border Patrol’s evidence collection team this week in Tucson, Ariz. The Justice Department, which oversees ATF and the FBI - and which is investigating Terry’s murder - has steadfastly denied the existence of a third gun. Court records have previously only mentioned two weapons: Romanian WASR AK-47 type rifles found at Terry’s southern Arizona murder scene on Dec. 14, 2010. 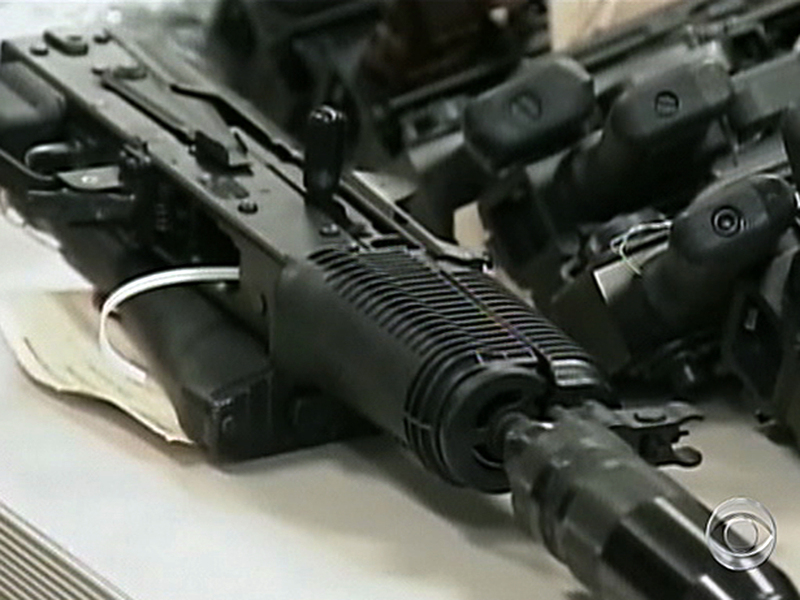 Both weapons were sold to suspects who were under ATF's watch in the agency’s controversial gunwalking case. Also, a ballistics report only mentions the two WASR rifles and states that it's inconclusive as to whether either of them fired the bullet that killed Terry. But references to a missing third weapon, a Soviet-made SKS rifle of the same caliber as the WASR’s, have persisted since the crime. CBS News previously obtained and reported on secretly recorded conversations referencing such a gun. The tapes were recorded approximately mid-March 2011 by the primary gun dealer cooperating with ATF in Fast and Furious: Andre Howard, owner of Lone Wolf Trading Company in Glendale, Ariz. In the audiotapes, ATF’s lead agent on Fast and Furious, Hope MacAllister, tells Howard that a third weapon recovered at the Terry murder scene is an SKS rifle. It's unclear why a weapon would be absent from the evidence disclosed at the crime scene under FBI jurisdiction. If it’s proven to exist, sources familiar with the investigation say it would imply possible evidence-tampering for unknown reasons. CBS News’ calls and emails to the Justice Department and the inspector general seeking comment Tuesday were not immediately returned. In October 2011, the department released a statement saying that "reports of a third gun recovered from the perpetrators at the scene ... are false." In Fast and Furious, ATF allowed thousands of weapons to "walk" onto the streets without interdiction into the hands of suspected traffickers for Mexican drug cartels. An IG investigation faulted a dozen Justice Department and ATF officials for misconduct or mismanagement in the case. In June 2012, President Obama exerted executive privilege to withhold some Fast and Furious materials from Congress. That same month, in a bipartisan vote, Congress held Attorney General Eric Holder in contempt for failing to turn over the documents. That dispute is still pending in federal court.